Today we are introducing the Flash Briefing Skill API, a new addition to the Alexa Skills Kit, which enables developers to add feeds to Flash Briefing on Alexa, which delivers pre-recorded audio and text-to-speech (TTS) updates to customers. When using the Flash Briefing Skill API, you no longer need to build a voice interaction model to handle customer requests. 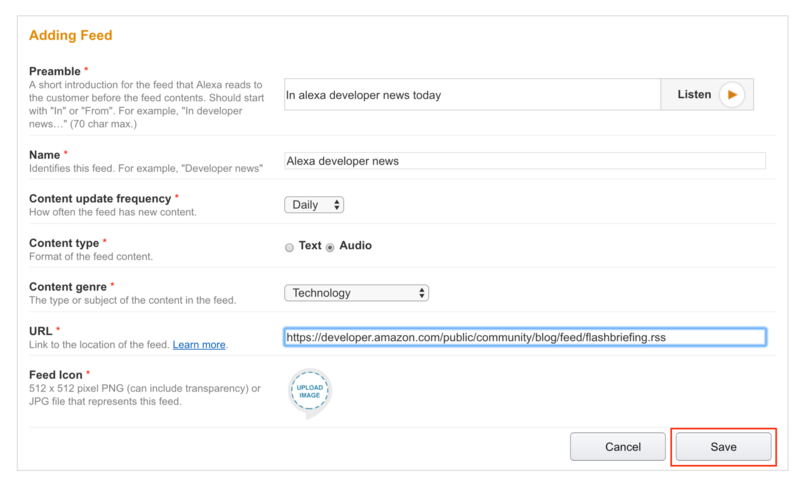 You configure your compatible RSS feed and build skills that connect directly to Flash Briefing so that customers can simply ask “Alexa, what’s my Flash Briefing” to hear your content. 1. Register for a free Amazon Developer Account if you have not done already and navigate to the Alexa Skills Kit box in the Alexa menu here. 3. Select Flash Briefing Skill API, fill out a name and then click Next. 4. Unlike custom skills, the interaction model for Flash Briefing Skills will automatically be generated for you, simply hit Next. 5. Now we will need to define our Content Feed(s). Your Flash Briefing Skill can include one or more defined feeds. Then, click on the Add new feed button. 6. You will then enter information about your content feed including name, how often the feed will be updated, the content type (audio or text), the genre, an icon as well as the URL for where you are hosting the feed. 7. Repeat these steps each feed you wish to include in the skill. The first feed you add will automatically be marked as the default feed. If you add more feeds, you can choose which feed is the default, by selecting it in the Default column. 8. Click Next when you are finished adding feeds and are ready to test your skill. For additional information check out the Steps to Create a Flash Briefing Skill page here. The content feed for your Flash Briefing Skill is created and hosted by you. The feed will provide audio or text that Alexa either plays or reads back to a customer. You can have one or more feeds in both JSON or RSS formats as long as you follow the accepted formats for a feed which are relatively simple, but there are some basic requirements for each supported format you will need to follow. Should be UTF-8 encoded. Unicode is not allowed. Be available 24 hours a day/7 days a week. You should contact Amazon at content-skill-submissions@amazon.com in the event of a planned outage. Amazon Simple Storage Service (Amazon S3), an Amazon Web Services offering, is a good option for hosting a reliable feed. Provide between 1 and 5 unique feed items at a time. If more are provided, Alexa will read or play the first five items only. Each item in the feed should be unique and should not overlap with content in another feed item. Contain an audio item, title and description, or a text item, title and description. For audio items, the text element must be present, but only the audio content will play to the customer. Content should be updated daily so that customers do not hear stale content. Here is an example content feed in JSON format that provides a single text item of content. Alexa will read aloud the maintext attribute content and then the titleText, description and redirectionUrl will all display in the Alexa app. The following table lists format details for each supported format and the items you can include in your content feed. Each message should contain the HTTP content-type header specifying the format of the payload. The remainder of the items in the following table describe how each item in a feed should be formatted. Indicates the format of the feed payload. Unique identifier for each feed item. UUID format preferred, but not required. Indicates freshness of feed item. ISO8601 format preferred. Any Simple Date Format accepted. Should be specified in UTC/Zulu time. The title of the feed item to display in the Alexa app. URL specifying the location of audio content for an audio feed. Yes, for audio feed items. The text that is read to the customer. description element containing the text to be read. For more examples and full details on the Flash Briefing Skill Content Feed click here. On the Test tab in the developer portal, make sure the slider is set to Yes (the default) to enable your skill for testing. Find your skill in the Alexa app by applying the Your Skills filter, and enable the skill. After you enable your skill, you can ask Alexa, “Alexa, what’s my Flash Briefing?” or “Alexa, what’s in the news?”. Your content should play or be read by Alexa. Note that if you have created or enabled other Flash Briefing skills, that content will play too. You should enable all of the feeds for your skill and test them with your Alexa-enabled device or app. Click Next when you have completed testing of your skill. Submitting your skill for certification is done in the same way as previous skills. Simply navigate back to your skill in the developer portal and click Submit for Certification. However, the guidelines for Flash Briefing Skills are slightly different so please check out the Flash Briefing Skill Certification Checklist here before submitting your skill.